Hasty, We choose this name for her as she was active and showing extreme movement from day one. Ter Waele Hasty carries the finest of the Crabbet and Old English bloodlines. 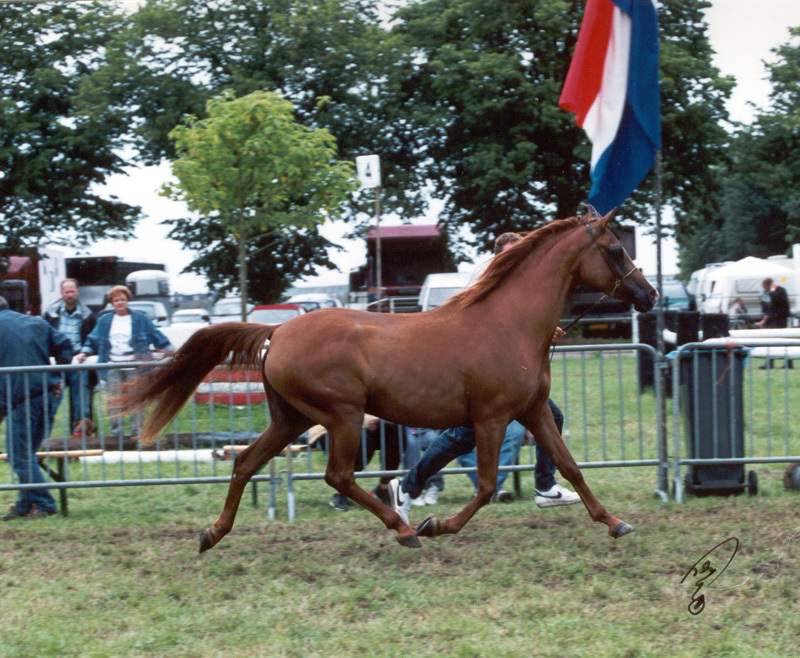 These bloodlines are the result of successful and careful breeding in the past and are the foundation for a horse which will be suitable for the show ring, heavy endurance, sport and competition. Ter Waele Hasty gave birth on May 8th, 2000 to Ter Waele Hamidah, whose name in Arabic means "Inner" and "Outer" beauty. Ter Waele Hasty also gave birth on May 21, 2003 to Ter Waele Hanan whose name in Arabic means "Gift Of God". Ter Waele Hasty is sold to the United Kingdom. Ter Waele Hasty was the last mare bred by my Father, so it was very important that I chose a home for her where she would be cared for and reach her potential. The new owners, mrs. & mr. Young will use her for endurance and breeding. We wish them the best. We have added to this little article a list of the in hand show and riding results of Rusleem. On both disciplines this stallion is a champion. He is really a horse who can be called "a Champion in all ways" and "a Champion for all reasons". Rusleem is an AHS Premium Stallion.